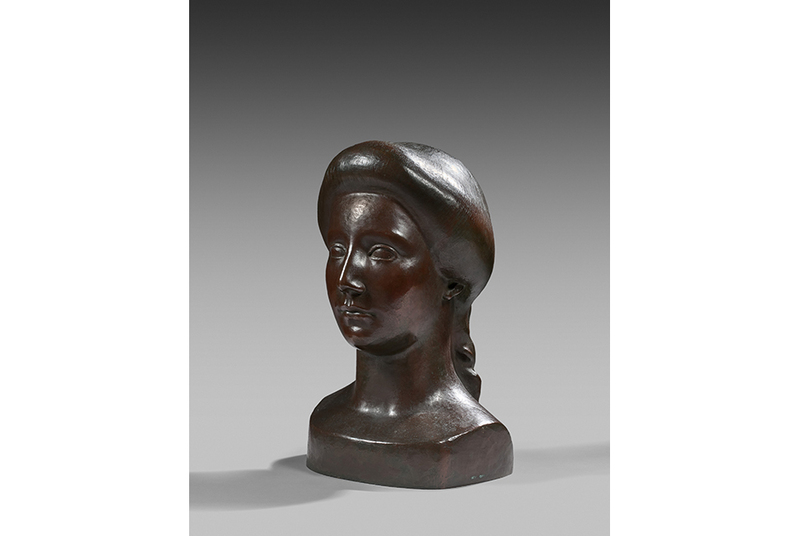 Aristide Maillol, Buste de femme ou Tête de Flore bronze, sand-cast iron with dark mahogany brown patina. Height: 38 cm. Estimate: 30,000 - 40,000. PARIS.- On Wednesday 27th March, Artcurial will host a monumental auction devoted to Old Master & 19th Century Art, during their annual event concurring with the Salon du Dessin. A section of the sale will be devoted to the dispersion of Fernand Lafarge Collection, a tribute to sculpture. Spanning five continents and 2000 years of history, the entire set is composed of 60 pieces from some of the greatest sculptors: Clodion, Jean-Antoine Houdon, Jean-Baptiste Carpeaux, Aristide Maillol. Ranging from the Haute Époque to Bourdelle, from archaeology to tribal art, thi passionnés s set is both encyclopaedic and pedagogical. This will also be the occasion for enthusiasts and collectors to discover how a family from Amiens became enamoured with sculpture, from generation to generation. The story of the Lafarge family is one of a successful French entrepreneurial business dynasty. In 1764, Jean Lafarge, freshly arrived from his native Cantal builds a modest umbrella factory in Amiens. The family business develops over the nineteenth century: dozens of branches are opened across Northern France. In the early twentieth century, leather goods supplant umbrellas and the Lafarge business, actively developed by Joseph Lafarge, opens new shops until Josephs death in 1962. He launches the collection, acquiring several sculpted and painted pieces by Jean-Baptiste Carpeaux (1827-1875). In 1962, his three sons take over the business, one of them being Fernand Lafarge. While chairing the first conglomerate merging Frances leading leather good companies, Fernand Lafarge considerably increases his collection until his death in 2013. Living with his family in their hotel particulier nestled at the foot of the Amiens cathedral, his artistic taste was undoubtedly nurtured by the secular buildings ornamental sculptures, as they were by the archaeological pieces bequeathed by the painter Albert Maignan (1845-1908) to the Museum of Picardy that he visited religiously. Fernand Lafarge thus becomes enamoured with medieval sculpture, leaving a powerful impression on his collection. Among the set presented by Artcurial, a relief of Christs arrest, a sober and sincere carved stone Pietà from the 16th century (estimate: 15,000 - 20,000) or an impressive limestone Virgin with child from the Champagne region, circa 1525-1530, intact with its original polychrome (estimate: 80,000 - 120,000). However, Fernand Lafarge did not merely collect statues of the Haute Époque. He also acquired a rare picture from a 15th century French painter, exhibited at the now legendary Primitifs Francais Louvre exhibition in 1904: La Résurrection de Lazare, avec un donateur. Dated from the latter half of the 15th century, it illustrates Christ resurrecting Lazarus, following his death a few days prior. Martha and Mary, sisters of the deceased, are present as well as the Virgin and the apostles. It is not surprising that this piece in particular enthralled Fernand Lafarge, the sculpture enthusiast: the strength of the figures and the carefully drawn drapery folds echo the coats of the stone and wood saints which adorned the churches of the period (estimate: 300,000 - 500,000). The collection, acting as a time capsule, will pause to pay tribute to the eighteenth century with two Clodion terra cottas (1738-1814) illustrating the early and latter days of the artist, represented by Cérès (estimate: 60,000 - 90,000) and an exceptional Lévrier which caused quite a stir amongst historians investigating Jean-Antoine Houdon (17411828) (estimate: 30,000 - 50,000). Jean-Baptiste Carpeaux (1827-1875) deeply marked the family, especially Fernand Lafarge who surrounded himself with significant works by the artist. The contemplation of La Mort de Carpeaux painted by Albert Maignan and exhibited at the Museum of Picardy undoubtedly pushed Fernand Lafarge to add on to the collection of Carpeaux sculptures inherited from his father. Among them, the bronze chef-model of Ugolin, famous tyrant of Pisa, locked in a tower with his children, condemned to starve to death (estimate: 100,000 - 150,000). Artcurial will also present the painted version of Ugolin in grisaille on panel, bringing further dimension to this emblematic figure in Carpeauxs career. (estimate: 40,000 - 60,000). Modern Art will be represented by several bronzes including a small gold-nuanced model, Baigneuse Accroupie by Antoine Bourdelle (1861-1929) (estimate: 15,000 - 20,000) and a Buste dune femme or Tête de Flore of Aristide Maillol (1861-1944), estimated 30,000 - 40,000. Antiquity and primitive arts were also of interest to this family of assiduous collectors. A Vénus pudique anadyomène, in green patina bronze circa 2nd or 3rd century illustrates Roman art (estimate: 8,000- 12,000) while a sculpted wood Femme assise sur un socle en pyramide from Solomon Islands, probably from the 19th century will highlight Oceanic art (estimate 15,000- 20,000). African and pre-Columbian arts will also hold an important place in this collection with pieces such as Personnage assis in ceramics from the classical period of the Veracruz culture, 450-650 BCE. from the Mexico Gulf coast (estimate 10,000- 15,000).